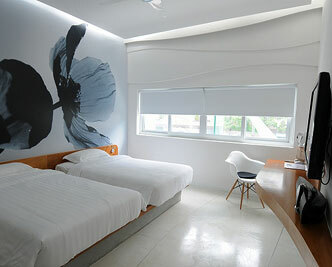 Lebiz Hotel is a bold new approach to accommodation. Redefining business travel with a full range of specialty services tailored to your business needs and cutting-edge technology to maximize your comfort and productivity, Lebiz Hotel offers an innovative “work haven” in the heart of Phnom Penh. Urban chic, business savvy. Be inspired by our sleek modern design as you effortlessly connect to local business opportunities through our custom library and the personalized services of our business concierge. Luxury accommodation, competitive edge. The next time business brings you to Phnom Penh, let Lebiz ensure that you venture forth well rested and well equipped to accomplish your professional goals. Lebiz　Hotel + Library in larger map.